My grandmother Buddy took me to Europe in 1967 when I was ten. 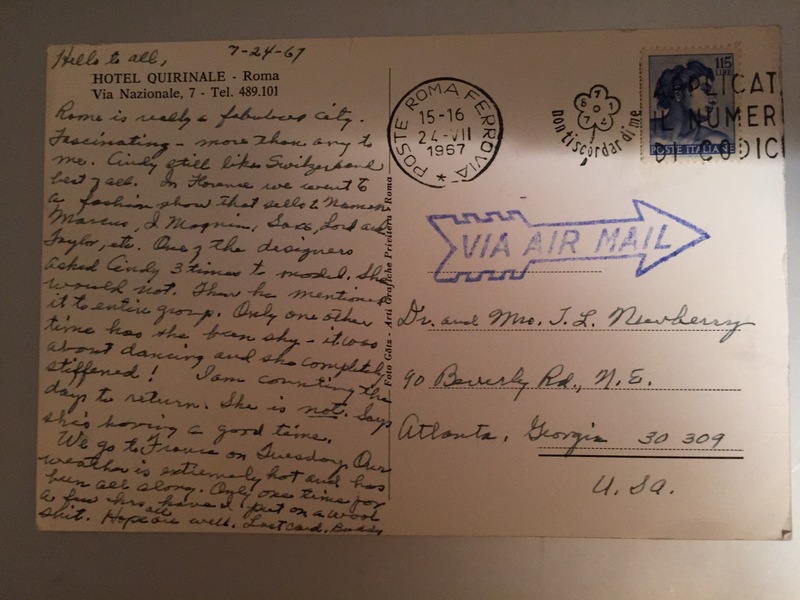 I just found this postcard she wrote to my parents. It felt good to know that I’ve always loved to travel and that I’ve never liked being the center of attention. You and me both, sister. What fun to find such an old postcard, and from your grandmother! I know there are some old European postcards from me to my parents from 1969-70 in my mother’s stuff (I was in boarding school; they were home), but it’s embarrassing to read what I wrote. It shouldn’t be, though, huh? Ha, Anne. And nope, shouldn’t be embarrassing to read our old postcards home–but I know what you mean. I almost threw away an old photo of myself today for that very reason, but I kept it. ‘Cause that was me at one point along the way. Yes, something about affirmations of who we are from those who have always known us. Exactly, Tricia. Also, it’s one thing to think I’m a certain way but to hear someone else say the same thing about me makes it real in a different way.